The Office of Capital Planning and Space Management (CPSM), in cooperation with Grants and Contracts Accounting, has implemented the INSITE Space Survey module. This system allows the Space Survey Administrator in CPSM to publish online information for current space data (room, use, org, functions, principal investigator, occupants, grants, and more). This information may then be viewed and updated using a web browser by "Space Surveyors," typically building or financial managers within each department on campus. Once the Surveyors submit space information, the Space Survey Administrator can reconcile these Spaces and update the database. 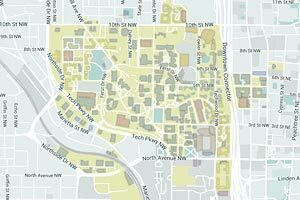 This will result in a more current and up-to-date space inventory for the campus. Training sessions for the FY 2018 Space Survey will be held on Tuesday March 13, and Thursday March 15, 2018. The slides from the session are posted here. Contact John Holcombe for further information about the INSITE Space Survey module. Contact Grants and Contracts Accounting for information about their use of the system for the biennial Institute space study.